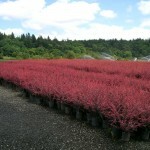 A dense shrub with deep red foliage. The form is vase shaped. The new growth is bright red, matures to rose-red mottled with white. The fall color is rich red. It needs full sun for the best color; it can be greenish in shade. It is easily grown in average soils, as long as they are well-drained. 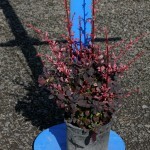 Use as a focal point in the shrub border or for mass planting. Can be pruned if needed.